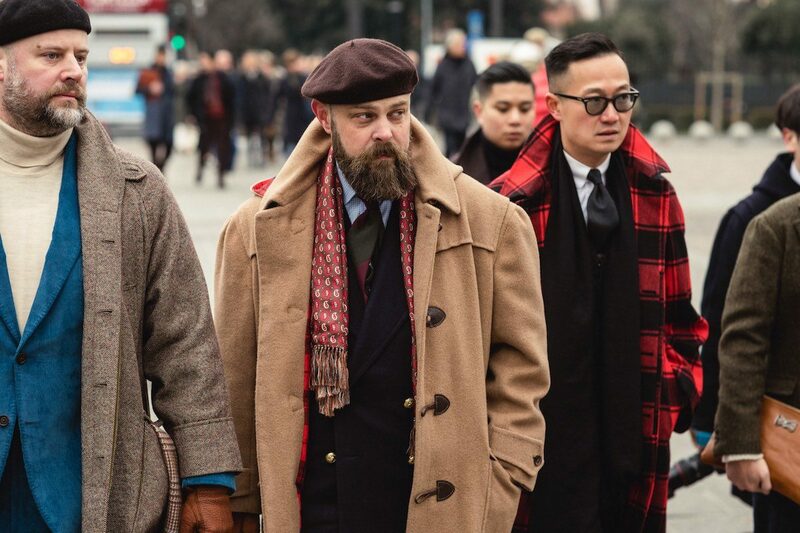 Anthony Madsen-Sylvester, Ethan Newton and Kenji Cheung entering Pitti Uomo. Photo Milad Abedi. The beginning of a New Year is always exciting as it begins with the biannual menswear trade-show Pitti Uomo, which took place last week within the walls of the fourteenth century Fortezza da Basso, in Florence. For some, it’s as much of a run-way show as it is a trade-show, as attendees turn up in their latest wares eager to impress and hoping to catch the eye of lurking street style photographers. It has, though, consistently been marred by the ‘Pitti peacock’, a special kind of breed of cretin that gets in the way and raises your blood temperature. Thankfully, extinction is looming due to the organisers getting rid of ‘the wall’. 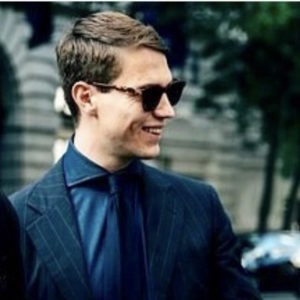 As a result, menswear enthusiasts with an actual purpose could freely go about their business, and genuine street style was the main focus once again. While foul weather thankfully held out last week, it was darn cold in Florence and Pitti-goers packed sensibly. Sporting shearling jackets to combat the chill, we saw a variety of styles worn in a number of ways, it was clear that a shearling jacket should be considered your new best friend - you just perhaps don’t know it yet. Reliable, durable and investment-worthy, wear it with a roll-neck, raw denim jeans and chunky soled boots and you'll be good to go. Check out Schott, Cromford Leather and the Neapolitan outfit Rifugio. You’d think that a functional accessory such as a scarf would mostly be used for its original purpose; to keep the entire neck warm. Yet, most attendees were draping their scarves louchely over their shoulder blades and ending up at their waist. Adding sharp contrast, colour and character, the scarf was fully embraced as the obvious go-to statement piece. Give it a go and try to be bold with options from Begg & Co, Anderson & Sheppard and Serà Fine Silk. It’s for sure a broad subject and theme, but this season we were practically engulfed by cashmere and woollen yarns. Roll-necks, V-necks and chunky Arran knits were there in abnormal numbers, especially with tailoring. Could it mean that the shirt and tie’s demise is brewing stronger and stronger? Perhaps. But, perhaps not. After all, it was cold, and if you happen to have been wearing tailoring sans overcoat, knitwear was and is the hot water bottle. Whether it was plain colours worn in a tonal way or adding an aforementioned pop of colour or texture, let the knit embrace you and seek the warming expertise of Inis Meáin, Doppiaa and Shackleton. 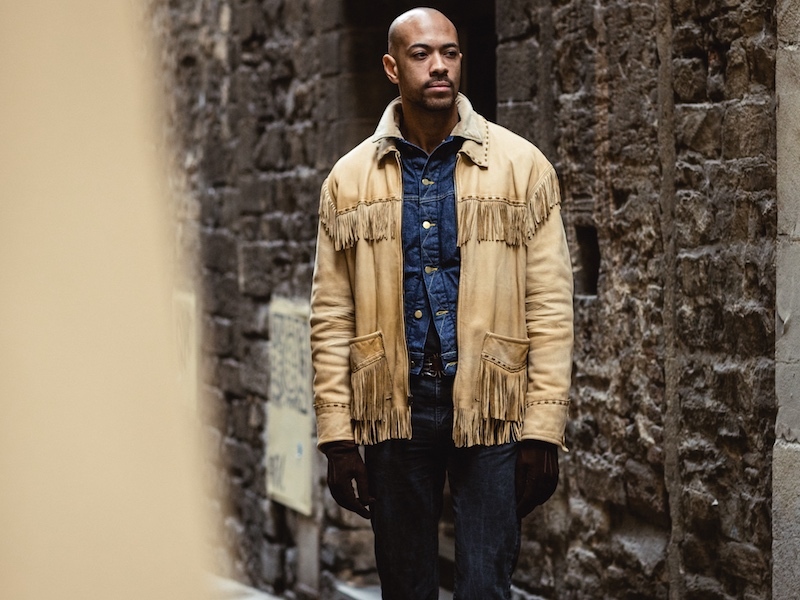 For the last few iterations of Pitti Uomo, we’ve seen subtle nods towards American mid-Western style appear here and there. Last week, however, it was everywhere. We saw tassel-fringed jackets, heavy plaid shirts aplenty, frayed, cut-off denim jeans and high-heeled suede boots. We’re all for it - after all who doesn’t like a slight touch of renegade notoriety and channelling your inner Butch Cassidy and the Sundance Kid. Give it a go with the help of Barbanera. Jonathan Edwards sporting a Western-inspired ensemble with a Polo Ralph Lauren jacket. Photo Milad Abedi. Autumn/Winter is never going to be the most exciting season in terms of the range of colours to brightens one’s day. It’s the subdued season, where men and women (unless they're accustomed to dressing garishly and brash like the aforementioned-nearly-extinct-peacock) go rather incognito with colour. Greys, blues, browns and greens are the go-to. How do you juxtapose that? Well, fill the syringe with colour and inject it disguisedly. Whether it’s via your choice in socks, necktie, scarf or headgear, don’t be afraid to indulge. 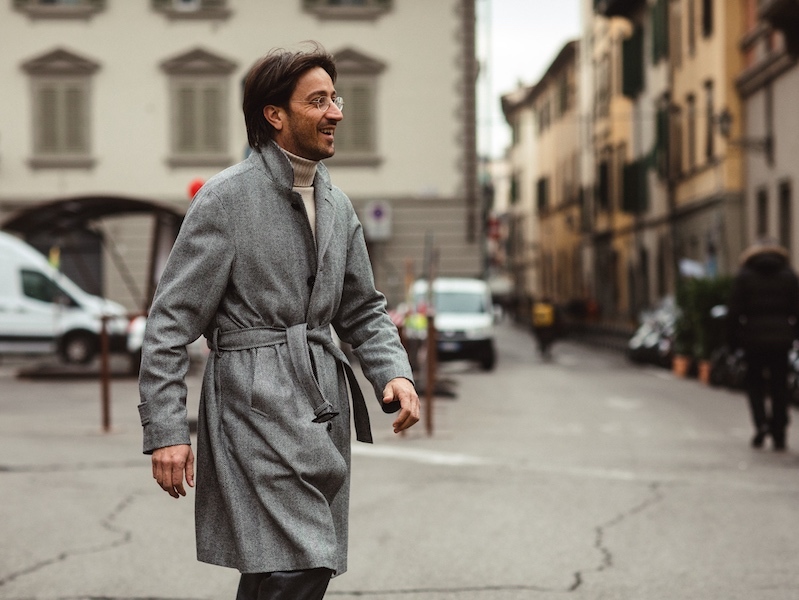 Given the Florentine chill, overcoats were very much a necessity last week and in recent winter seasons, we’ve seen the growing presence of the raglan sleeve and the use of a louche belt. The fundamental reason behind the attraction here is clear and simple: a need for comfort and softness. A raglan sleeve differs to a traditional sleeve head as it is extended beyond the shoulder to the collar, as such it drapes in a totally different way. Purchasing a raglan overcoat for next winter should be on everyone’s shopping list and in regards to the louche belt, cinching an overcoat to the waist creates volume and fluidity. We think that this hybrid raglan sleeve De Petrillo overcoat with a belt justifies the previous statement. Alessandro Agazzi sporting a hybrid shoulder De Petrillo coat. Photo by Milad Abedi.